Marines awarded medals to five retired military dogs — four Labrador retrievers and a German shepherd — for serving “with distinction” in Afghanistan and Iraq. At the Wednesday evening ceremony in the Rayburn House office building on Capitol Hill, Marine Corps Lt. Gen. Brian Beaudreault, retired Marine Corps Col. Scott Campbell and former Cpl. Jeff De Young announced the recipients of the American Humane Lois Pope K-9 Medal of Courage as American Humane President Robin Ganzert placed the medals around the necks of Alphie, Capa, Coffee and Ranger. Gabe, a yellow Labrador retriever, died in 2013 after serving in more than 200 combat missions in Iraq as an Army specialized search dog. Alphie, a black Labrador retriever, completed two tours in Afghanistan and is now an explosives detection dog for the Transportation Security Administration. Ranger, another black Labrador retriever, served with Marines in Iraq and Afghanistan, finding improvised explosive devices. For Capa, a German shepherd, this was not his first medal. He received the Navy and Marine Corps Commendation Medal for meritorious service in Iraq as an explosives and patrol dog. 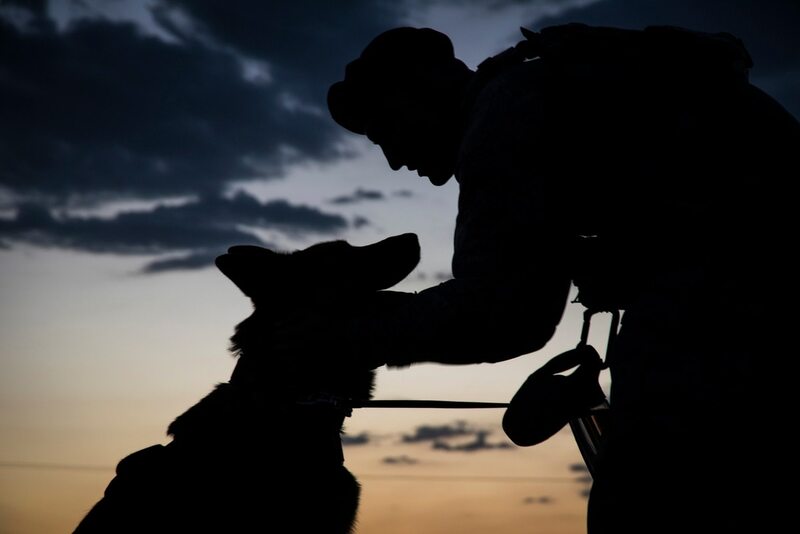 “Military dogs have saved countless lives in the fight for freedom and they deserve the recognition that they’re getting this evening,” said Rep. Gus Bilirakis, R-Fla..
Military dogs play an integral role in keeping military men and women safe in the field, Ganzert said. The animals have the distinct ability to detect explosives and weapons, and they put their lives on the line to do it. “It is estimated that each of these dogs save 250 lives,” Ganzert said. Capa’s handler, Navy Master at Arms Megan Wooster, couldn’t make the ceremony due to pre-deployment commitments, but her mother, Kim Stamate, accompanied the dog. “He kept my daughter safe and secure,” she said. “They bonded very deeply,” Stamate said. Wooster has since adopted Capa. Stamate will take care of Capa during her daughter’s next deployment — an estimated 18 months. “I’ve already thought about how it’s going to feel to have to give him back,” she said.